The Sun’s interior is made up of three regions, depending on which type of energy transport mechanism is dominant. The innermost layer is the core (r = 0.25 solar radius), where all of the Sun’s energy is being generated through nuclear fusion of hydrogen. This is followed by a radiative zone stretching outward from the core to ~75% of the Sun’s radius, where transport of energy is through photons, i.e. radiation. 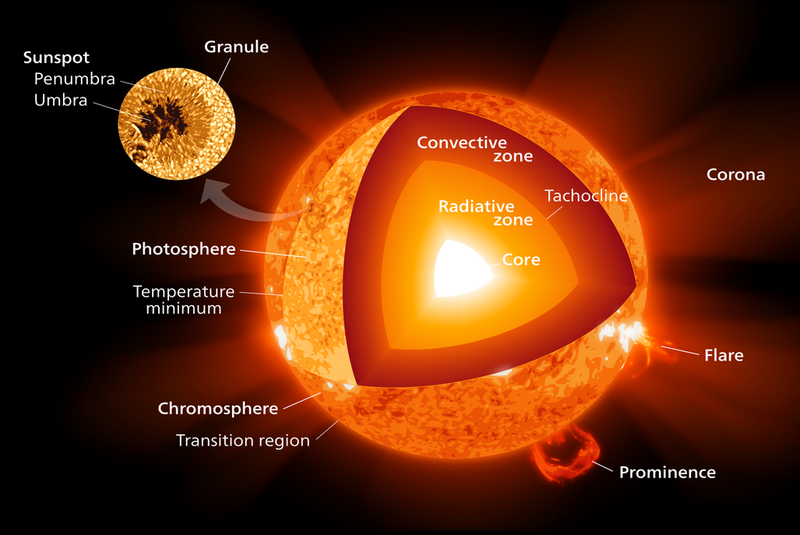 The convection zone makes up the outermost layer of the Sun’s interior and extends the rest of the way from the radiative zone up to the Sun’s photosphere (where all the light we see from the Sun is coming from); energy is mainly transported through the movement of fluid/plasma in the convection zone. Sandwiched between the radiative and convection zone is the radiation/convection boundary (also known as the overshoot layer or the tacholine), where transition between radiation and convection takes place. The change of temperature as a function of a depth (known as the temperature profile) of a star is affected by absorption of radiation by intervening matter. The degree to which radiation is being attenuated is measured by a quantity known as opacity (also known as absorption coefficient). The greater the star’s opacity, the more opaque is the star; we see less into its interior. Chemical composition affects a star’s opacity, as different elements absorb/scatter light differently. A star with a higher content of light absorbing/scattering elements has a higher opacity and vice versa. The Sun’s opacity is thus determined by its chemical composition. The Standard Solar Model (SSM) is a mathematical model that tries to encapsulate the various facets of the Sun, such as its energy transport, chemical composition, temperature profiles, and many more. An accurate treatment of the Sun is crucial as the SSM is used to test stellar evolution theory — a substantial correction to the SSM might entail a significant revamping of our current understanding of how stars work. Solar modelers faced a hit when re-analysis of the Sun’s spectrum forced them to reduce the inferred amounts of solar carbon, nitrogen, and oxygen by 30-50%. However, predictions of solar models using the revised elemental abundances disagree with observations from helioseismology, which is a technique that probes the Sun’s internal structure using acoustic waves. If both spectral analysis and helioseismic observations are correct, then there must be something wrong about our current understanding of the Sun. How do we resolve this? Hint: opacity. Other researchers have found that as long as the true mean opacity of the Sun’s interior is ~ 15% higher than predicted by solar models, this discrepancy can be resolved, as increased opacity makes up for the reduced elemental abundances. This means we have to re-evaluate the solar opacity in a model-independent way: direct measurements at conditions mimicking the Sun’s interior, where temperatures sore to millions of Kelvin. 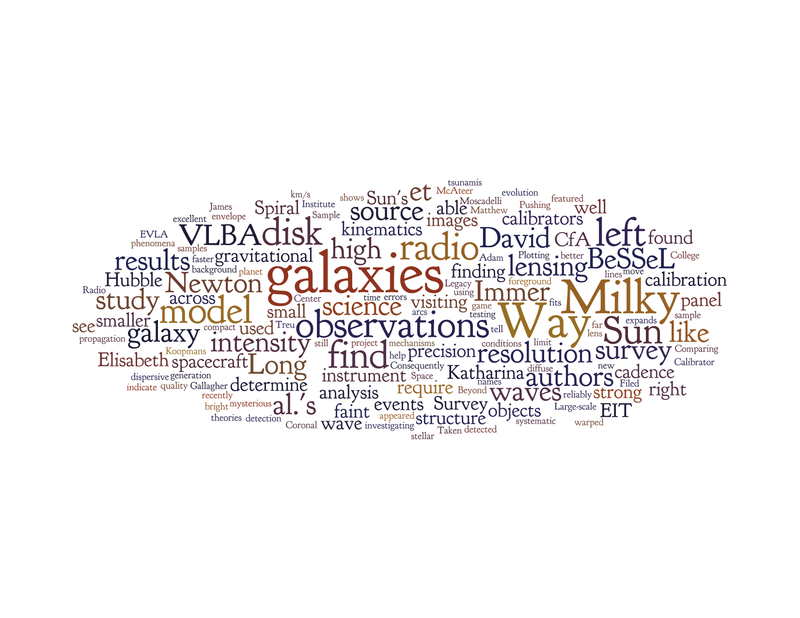 But millions of Kelvin… isn’t that extremely difficult, you ask? This is where today’s paper comes in. The authors of this paper used a facility known as the Z-machine in order to simulate the solar interior. The Z-machine is the world’s most powerful X-ray pulsed power facility located at Sandia National Laboratories (called Z-machine because particles shot from the accelerator collide with one another along the z-axis). Using the Z-machine, the authors measured the iron opacity at conditions very similar to those in the Sun’s radiation/convection zone boundary. This boundary layer is where the discrepancy described above is the most significant. Iron is chosen for the opacity measurement as it is the main opacity player at the boundary, contributing up to 25% of the total opacity. This is because iron has the largest number of stably-bound electrons and electrons are the main sources of opacity in the solar interior. In order to better understand the physical processes that affect opacity, the authors performed measurements over a range of Te/ne values, where Te is electron temperature (the temperature at which the velocities of electrons produce a certain type of distribution known as the Maxwell-Boltzmann distribution) and ne is the electron number density. 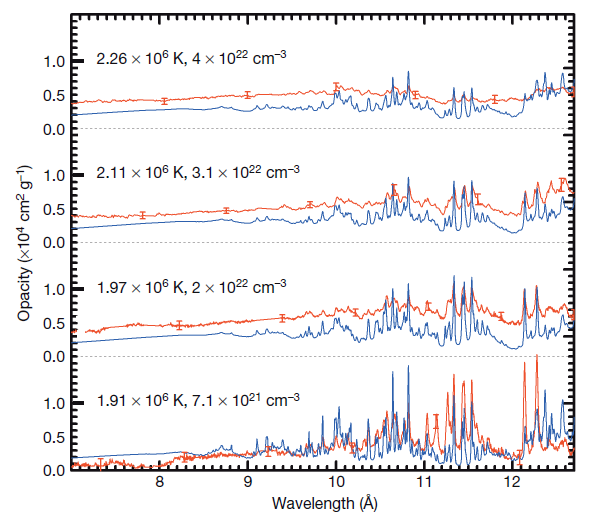 Figure 2 compares their measurements (red lines) with calculations from a solar opacity model (blue lines). As Te/ne increases, opacity increases, line features decrease, and the lines become broader. Although the model also varies as Te/ne changes, the changes are smaller compared to those of the direct measurements. The model and measurement agree best at the lowest Te/ne, but they diverge as Te/ne increases. The authors compared their opacity spectrum at a specific Te/ne condition (2.11×106 K / 3.1×1022 cm-3) that is deemed to represent the radiation/boundary zone most accurately) with calculations from more models, as shown in figure 3. None of the models reproduces the measured opacity spectra — as a matter of fact, the measured opacity is 30-400% higher than predicted. If one recalls back to our earlier discussion on the disagreement between spectral and helioseismic observations, we need the mean solar opacity to be ~15% higher than prediction. The measured wavelength-dependent iron opacity is 30-400% higher than predicted, which translates to ~7 (+/-3)% higher than the predicted mean opacity, i.e. roughly half of the change needed to resolve the solar discrepancy. Bearing in mind that iron is only one of the elements that contribute to opacity (albeit a main one), the mean opacity is expected to be much higher when all the elements present in the solar interior are considered. To conclude, predictions of current solar models disagree with results from helioseismic observations. This discrepancy can potentially be resolved if the true mean opacity of the Sun is ~15% higher than solar model predictions. 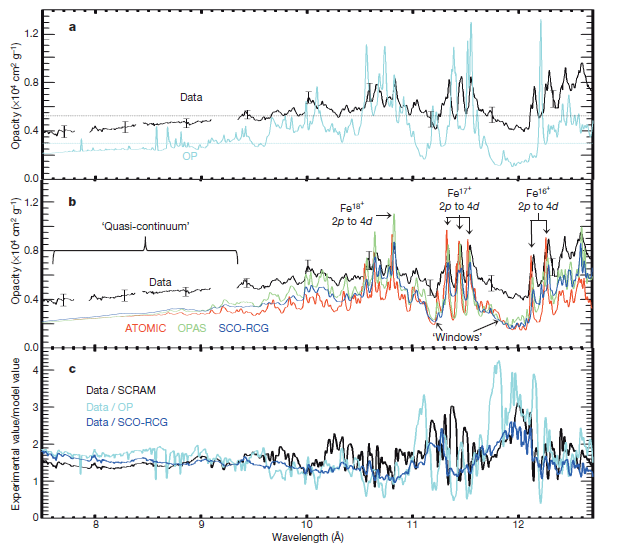 The authors of today’s paper measured iron opacity at conditions similar to the Sun’s radiation/convection boundary layer and found it to be 30-400% higher than model predictions, translating to roughly 7% higher for the mean opacity. As such, there are missing ingredients in current solar models and corrections need to be made. It is sobering (and humbling) to ponder how much we still don’t understand about how the Sun works, given that it is the closest star to us and that most of our understanding about other stars is based on what we understand about our Sun. Hello, their science samples consist of thin foils of iron (so I believe they’re looking at the bulk properties), which they heated up with X-ray. The whole process took place in ~10 ns. The results published here is a collection of 22 experiments conducted over 3 years. If I understood it correctly, the Z-machine reproduces the temperatures of the sun (what is indeed amazing! ), but not its pressure or density, so how can it help to draw accurate conclusions about the sun? Hi! Temperature and number density of electrons (the quantities the authors are measuring here) are actually related to pressure and density. Knowing these two implicitly gives you the other two. All these quantities are related through thermodynamics and are no independent of one another. Hope I’ve answered your question! What were our earlier models of solar opacity based on? This seems like a really major discrepancy to have gone completely undetected until now. I agree with Sam, it’s a little shocking that solar opacity models could still be 15% too low. Are there any other ways to explain the discrepancy besides inaccurate opacity models? Can a greater electromagnetic force inside the sun account for the discrepancy?